Transform your school playground into an area for cross-curricular learning and play. Our creative Volcano Thermoplastic Playground Marking design opens up a world of imaginative play games as well as a new geography resource. By installing a Volcano Thermoplastic Playground Marking in your school playground, you can teach exciting and engaging geography lessons children will truly enjoy and understand. Children will happily participate in stimulating activities as they begin to understand and develop their knowledge in one of the three focus areas of the Primary School Geography curriculum; human and physical geography. 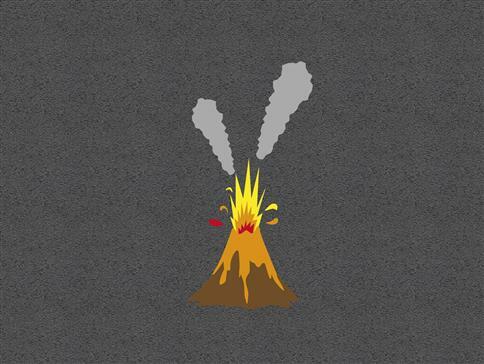 One stimulating activity is using chalk to draw or describe the key aspects of volcanos and even earthquakes on the playground tarmac; further developing children's geographical understanding and geographical vocabulary. As well as providing an exciting, key resource, our Volcano Playground Marking will naturally be used as a focal point for imaginative play during playtimes. When involving other children in their imaginative play and child-led games, their communication, language and teamwork skills will further improve as children express themselves with our vibrant playground marking.